This is a hand crafted wooden bone decoration, cut on a scroll saw. It is aprox. 12 inches long x 4 3/4 inches at the widest part. The lettering is cut from 1/4 inch birch plywood on a scroll saw and is 1 1/4 inches tall. Both items are lightly sanded. It is available in four different finish combos. There are two mini pegs for hanging a leash or collar. 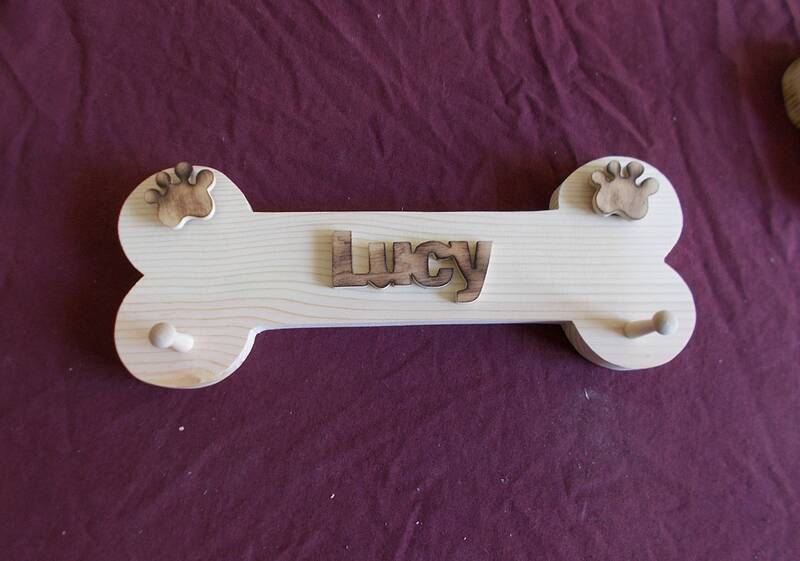 The two small "Paws" pictured at the top are supplied separately and are used to cover the screw holes. After mounting the bone to the wall simply attach the paws using the supplied self sticking Velcro pads. The bone will accomodate up to 11 letters (a space counts as a letter). Upon check out please make sure to include the name that is going on the bone. Free shipping!